Introduction The 2015 BTS Emergency Oxygen Audit showed that 4/10 patients on oxygen did not have a valid prescription, 1/3 patients received inappropriate levels of oxygen and almost 1/10 patients were at risk of iatrogenic hypercapnia. Over half of hospitals didn’t provide adequate training in oxygen provision and monitoring. Despite significant efforts to improve practice at King’s College Hospital, the audit revealed a drop in appropriate prescribing. We conducted a staff survey of attitudes to and knowledge around oxygen prescribing to better understand the barriers. Methods Hospital based healthcare professionals completed a survey of attitudes to oxygen prescribing as well as a knowledge quiz using Survey Monkey®. Results There were 113 respondents. 67% were doctors (13% Foundation Year; 44% ST1-8; 38% Consultants). 29% were nurses, (76% Band 5/6). Most worked in acute specialties (28% A&E, 15% anaesthetics, 14% ICU, 13% acute medicine). Only 66% of respondents believed that oxygen should be prescribed on a drug chart. Among doctors, support for oxygen prescribing was high, especially in acute medicine (93%) and A&E (86%). It was lower amongst ICU doctors (50%). Amongst nurses, support was 41%. 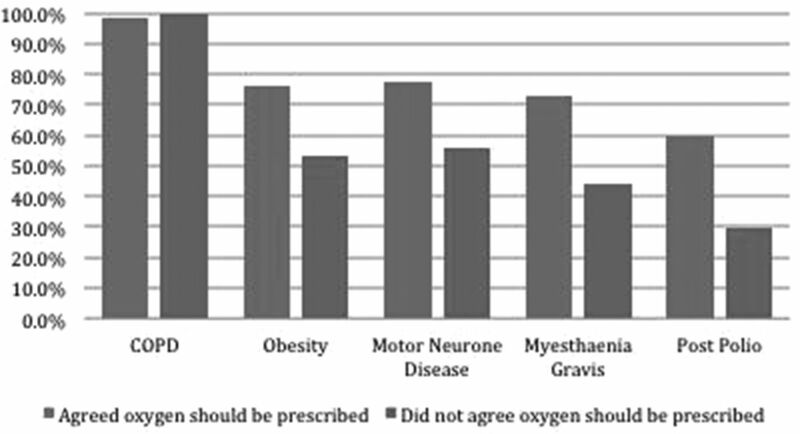 Nurses working in medical specialties largely agreed with oxygen prescribing (80%). Those working in A&E and ICU did not (33% and 22% respectively). Perceived barriers to prescribing were lack of time, lack of awareness/habit, difficulty accessing computers and a perception that the oxygen prescription would not allow for changes in a patient’s condition. Those who believed oxygen did not need to be prescribed felt concerned that prescribing could delay emergency treatment. In the quiz, this group was less able to identify patients at risk of hypercapnic respiratory failure (see figure 1). Conclusion Oxygen prescribing is still seen by many as a cause of possible delays in emergency treatment. Education of clinical staff, particularly nurses, around risks as well as benefits of emergency oxygen therapy is still needed. Emergency oxygen prescription needs to be as flexible as possible so that prescribing is seen as a means to deliver right care and reduce these risks particularly for those patients at risk of hypercapnic respiratory failure.